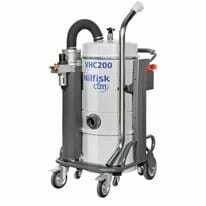 The Nilfisk CFM VHC200 industrial vacuum cleaner is an easy to use compressed air industrial vacuum. Designed to be used where electricity is unavailable or forbidden, it can recover solid and liquid material. It is equipped with a powerful Venturi system and available in several versions. Both the small and large containers are equipped with wheels and a practical handle which simplifies all emptying and lifting operations. With a robust trolley and large castors, it’s good for use on uneven floors. The ergonomic design provides operator comfort. The compactness of the VHC200 is a plus. This unit can be delivered painted or stainless steel, as well as in a flameproof ATEX-compliant versions (for zones Gas 1-2 and Dust 21-22). The VHC200 100 L can be delivered for Atex and non Atex environments (50 L only for Atex). Filtration is provided by a star filter with a total filtering surface of 19,500 cm². Whenever absolute filtration is required, a HEPA filter is available and easy to mount. The unit is also equipped with a standard manual filter shaker. Pneumatic filter shaker can be fitted upon request. The VHC200 is always equipped with a pressure gauge.